Many homeowners dream of a backyard oasis to beat the Texas heat. A custom pool is a great idea, but also a hefty investment – one that could turn into a costly mistake if you aren’t careful. To make this dream a reality, you’ll need to partner with a DFW pool builder you can trust. If that’s the question you’re asking, we’ve got answers. Choosing the right builder for your pool can be a long, tricky process, but it doesn’t have to be. With time, thorough research, and careful planning, you can avoid many of the pitfalls that turn a pool into nothing more than a drain on your bank account. Before choosing which pool builder in the DFW metroplex to hire, you need to decide what kind of pool you want. Do you want an in-ground or an above-ground pool? What materials do you want the builder to use? You’ll want a versatile builder with the flexibility to ensure you’ll have your vision carried out correctly. You also need to consider safety measures. Fencing, pool covers, lights, and alarms are some examples. Check your local regulations, homeowner’s association rules, and your insurance policy. They may require that your pool have certain pool safety features. Make sure you keep these in your final feature list and price calculation. How Will Your Pool Be Positioned? The state of your backyard can create obstacles for the builder. Hills, trees, and large rocks are common roadblocks. The more work the construction crew has to do before building your pool, the more money you can expect to pay. These natural obstacles are why top DFW pool builders ask to inspect your property before giving you an estimate. If the builder sees any potential issues on the site, they’ll let you know and include the extra cost in their quote. How do all of these factors translate into hard numbers? We’ve created a guide to help you calculate how much a pool will cost. These numbers will help you identify what you can and can’t afford, solidify the vision for your new pool, set aside money for the project, and compare the custom pool builders’ offers. Start compiling a list of pool builders and companies that your friends and family have used in the past. The most honest pool builder reviews you’ll get will be from people you know – family, friends, and neighbors. If no one you know has had a pool built recently, walk around your neighborhood. Who has a pool that you like? Is there anyone currently getting a pool installed? Don’t be afraid to knock on doors if you have to. Get the names of the DFW pool builders they hired. Ask them about their experience with the staff and crew. Have they had any issues with their pool? If so, how did the company handle it? The answers you get will give you a feel for the quality of the company’s work and customer service. 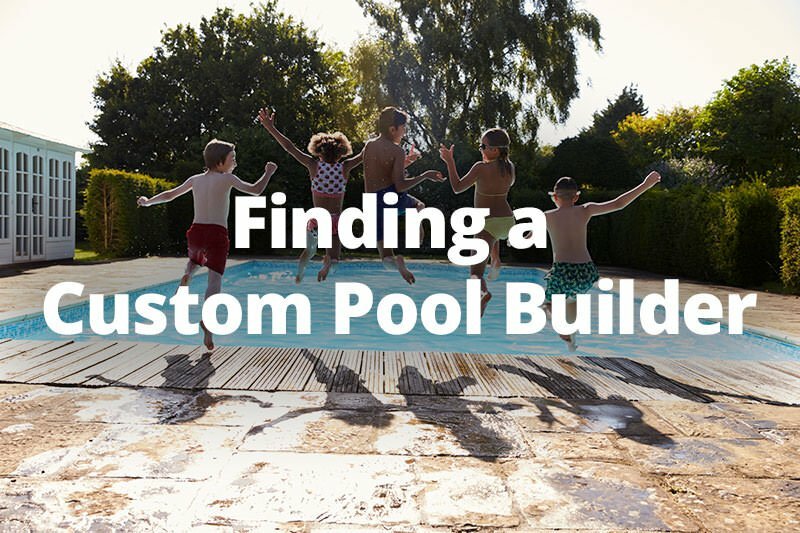 Now that you’ve got a list of recommended local pool builders, search for those companies online. Their company website should have most of the information you need. For reviews and photos of past work, you may need to browse their social media profiles and other web properties. When searching for a pool builder, look for these qualifications. A lack of maintenance services doesn’t have to be a deal-breaker. It could be a sign that the company doesn’t have many employees. They don’t have the resources to help owners with maintenance. A smaller team can still build a quality pool and provide excellent customer service. On the other hand, there are plenty of companies that specialize in pool maintenance. They aren’t builders and make their money cleaning others’ pools. This narrow focus translates to dedicated crews that perform quality, timely maintenance. If you’re considering dedicated pool builders, keep in mind that you’ll end up working with two companies – the builder and a professional maintenance team. Are you willing to go through this same process with pool maintenance companies? If you answered no, then a company that offers construction and maintenance might be a better fit for you. In your research, you’re sure to come across negative pool builder reviews. These don’t necessarily mean that the company is bad. The best builders often have a few bad reviews. No construction project ever goes completely to plan. Instead of writing the company off when you see a negative review, take a closer look at it. What is the reviewer complaining about? How did the company respond to the problem? You can learn a lot about a company from their mistakes. Look for professionalism and an eagerness to make things right. Of course, a company with multiple, unresolved complaints should be a red flag. These are tell-tale signs of a builder with poor customer service, shoddy work, and a habit of abandoning projects. Heed the warnings in these pool builder reviews. Don’t put yourself in the same horrible situation. It’s time to reach out to the companies you’ve narrowed your list down to. Schedule meetings with staff for more information if need be. At the meeting, discuss your vision for the pool – the design you like, the safety features you need, and the aesthetic features you want. Ask for prices/estimates per item as well as a total estimate so you can check the math yourself. You’ll also be able to make a more informed comparison between all of the builders’ quotes. If the salesperson decides to throw in discounts or freebies, make sure all of them in writing. The last thing you want is to make a decision based on an estimate that the builder won’t honor. The most important thing to remember is never to sign a contract during the first appointment. Speak with all of the builders on your list first, compare prices, and make a choice that gives you the most confidence. Not rushing through a decision will keep you from being persuaded by a clever sales pitch. We hope Willsha Pools has made it on your short list of custom pool builders! Our team is eager and would be more than happy to meet with you, discuss your vision, provide a pool estimate, and work with you to make your dreams a reality. What are you waiting for? Get a jump on your new pool today! Was looking for a pool builder in DFW that was experienced, trustworthy and responsive and Willsha was able to build me a new pool that is the one of my dreams! Willsha Pools was hired to repair drilled holes, large cracks, resurface a very large deep diving pool, replace equipment, replace tile, apply chemicals for a sound, healthy, functioning pool. I received bids from several companies and chose Willsha because of their professional approach, knowledge and how well and timely they responded to my calls. They were very competitive but not the cheapest. The few extra dollars was well invested! This company is excellent! The work was on schedule. The quality surpassed my expectations and the communication and education was exceptional. I highly recommend this company. Willsha will be my referral choice and my go too company for my personal pool needs.. I had a full pool resurface and remodel done with Willsha Pools, and they did a fantastic job. The crews were in time and very professional. The workmanship was impressive, and I was continually informed of the stages and progress made. From the get go, they were a few steps ahead of the competition. Their design was unique, and they EXCEEDED every promise and every due date. In other words - under promised and over delivered. To me communication is key when dealing with contractors and they absolutely nailed it! I am so pleased with every phone call, repair, and transaction with Willsha Pools. I would highly recommend them if you are considering any phase of pool ownership. It is a huge investment and you want it done right!